I'm a total bread kinda person. I LOVE IT! I like to walk in the bread section of Fresh Market and pick up the artisan bread bags and smell the bread. I think I've actually hugged a loaf or two. Gah! Bread is soooo good! But there are many a times when I just don't have the time (or energy) to make beautiful homemade breads and rolls. Thanksgiving is totally one of those times. I spend a bulk of my time baking up the desserts and focusing on sides. I usually end up just going out and buying a bag or skipping the rolls all together. 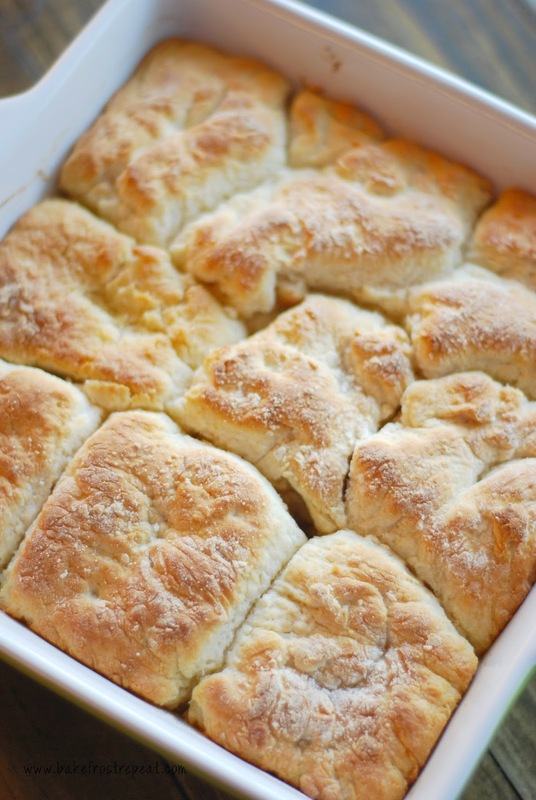 I'm definitely making these 7-Up Biscuits for our Thanksgiving Day meal. They're quick, easy and so delicious. I mean, they bake up in a layer of melted butter. Yeah, I said melted butter! So you know they are gonna be good. In a large mixing bowl, cut the sour cream into the baking mix using a fork or a pastry blender. Next, pour in the 7-Up and stir to form a soft dough. -- It will be very sticky. Sprinkle some additional baking mix onto a board or clean surface and pat out the dough and then cut 9 squares out. Pour melted butter into a 9 inch baking pan and then place the cut biscuits on top of the melted butter. Bake the biscuits for 12-15 minutes or until they are nice and golden brown on top. Oh, YUM! I love that you used Coca-Cola in last post's cake, and 7-Up in this post's biscuits! It's a fabulous soda theme. =) Bread is one of those things I always skimp on doing homemade for holidays, too, but these look SO good and totally do-able! This is such a fabulous recipe! I could live on bread. Pinned! I’ve used soda in bread before, but not in a good ol’ biscuit recipe. Looks great! Oh yum!! Your biscuits look so beautiful! I always see those recipes for popeye's type biscuits, but never got to making them. Do they taste similar? I love their biscuits! You had me at "sour cream!" Curious about the 7-Up in this. Sounds so easy I have to try it! These biscuits look absolutely amazing!!! 7 up? Genius! This is such a cool recipe, can't wait to try this!! !